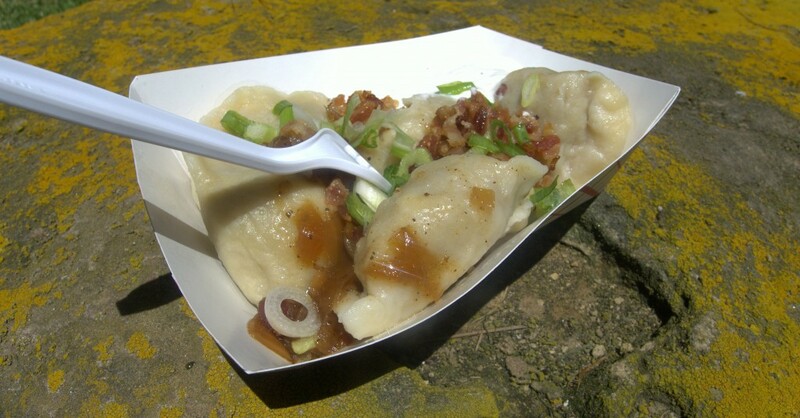 Pierogi Truck is not only the best Polish restaurant in San Diego—it’s the only one. There are Russian and Ukrainian restaurants in town, but if you want Polish food and left your matka at home, Pierogi Truck is the only option (for current location see pierogitruck.com). Even if there were three or four more Polish restaurants to choose from, the outcome of the contest would likely not change. Pierogi Truck is that good. From pierogi to sausages, Tom Bordyczewski and his mother, Bozena, know the Polish culinary idiom. It’s something with which I’m familiar, coming as I do from an Eastern European family and having married into a Polish one. The Wigilia, the Polish Christmas Eve tradition, is our family’s tradition, re-enacted every year, replete with pierogi, golabki and borscht. The golabki are cabbage rolls stuffed with ground pork, onions and rice, topped with a tomato sauce. They are, perhaps, the prototypical Eastern European dish: savory, comforting and robust. The Bordyszewskis garnish their golabki with chopped fresh scallions, which gives the dish a liveliness and just a hint of a bite. Also excellent are the sausages. The Polish sausage has a pleasant snap and a deep porky flavor that manages to be both savory and sweet. The kishka, Polish blood sausage with buckwheat or barley, onions and spices, is a particular treat for those so inclined. Served almost Sloppy Joe-style, it was, for me, a particularly pleasant trip back to a very old memory. It’s not the metallic flavor one might remember from sucking the blood of a cut finger in childhood; rather, it has a deeper and richer meatiness and an entirely unexpected creaminess. But the stars of the show are, not surprisingly, the pierogi, dumplings made from unleavened dough and filled with a wide variety of stuffings, either savory or sweet. Traditionally, the half-moon-shaped dumplings are boiled and then either baked or fried. The traditional garnishes are butter or fried onions. The Bordyczewskis garnish theirs with chopped scallions and bacon. Predictably, the bacon is a nice, if non-traditional, touch. Seriously, what exactly is notimproved by the addition of bacon? The versions offered by Pierogi Truck—rolled by family members back in Chicago and shipped out frozen (which works for pierogi)—are sublime. The dumpling for the potato-and-cheese version starts toothsome but seamlessly fades into the soft potato-and-cheese filling inside, with no clear indicator of where dumpling ends and filling starts. The ground-meat pierogi were good, too, but the fruit-filled dessert versions less so. The surprise for me was the spinach pierogi—a variety I had never tried before—with the vegetable flavors bringing something different to the party. My favorite, now and always, is the sauerkraut-and-mushroom variety; the combination of the fermented flavors of the kraut and the deep umami of the porcini mushrooms never fails to thrill. Checking a truck’s location on its website (or at sdfoodtrucks.com) may not be everyone’s idea of a way to approach a meal. Some, no doubt, will be put off by it. But they’ll be missing some wonderful, homey and hearty fare.